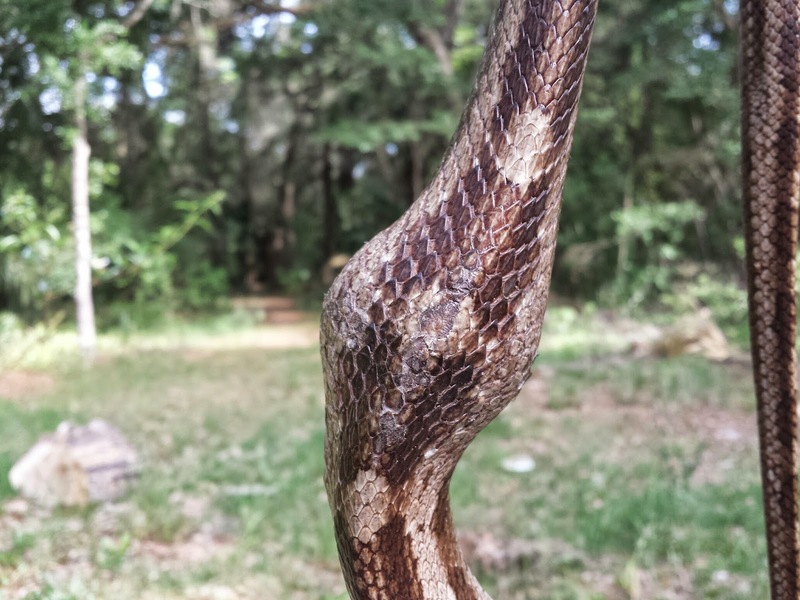 Search the over 2000 posts here at Pure Florida for "grey ratsnake" and you will find numerous posts that mention or show these awesome snakes. They climb, they get big, they tame down into pretty decent snake pets, they eat rats and squirrels ... what's not to love. I was actually lamenting the lack of them around PFHQ last week and blaming it on our lack of chickens. We used to have lots of free ranging banty chickens roaming PFHQ. When we kept chickens, you were practically tripping over ratsnakes, they love the eggs, they love the mice drawn to the spilled feed, and yes, they love chicks. The shortage of ratsnakes matches the past few chickenless years almost exactly. So, normally, I would have been thrilled to see this little guy in my timber bamboo patch. The only problem this time was "Grey" was busy cleaning out the bamboo cardinal nest that I've been watching for the past week or so. The youngish patch of (someday) giant bamboo sits right in front of where I park my JEEP and I've enjoyed peeking at it as I walk by each day. Normally, there is a cardinal Mom head sticking out of the top of the nest... peeking back. In fact, not 15 minutes before finding this snake, Bear,Coquina, and I had walked by and looked in. As we returned from our woodsy walk, as is my habit, I took one more look at the nest. Hmmm, what is that loopy thing? Oh crap, it's a ratsnake! A chick taken right out of the snakes mouth. It' slobbery, but still alive. Not only was it a ratsnake, but it was a ratsnake with one cardinal shaped lump deep inside it, AND another cardinal chick in it's jaws. I made a quick grab for the snake and he spit out the chick in his mouth. This was kind of fumbly, this "quick grab", because I was filming video with one hand and snake charming with the other. The ratsnake was super determined to finish his meal. When I let him go to check out the mouth munched chick, he climbed back up the bamboo and onto the nest. I grabbed him with one hand and plopped the snake saliva slimed, but still alive chick back in the nest ... after pausing to take a quick "hold the camera over the nest and shoot down" kind of shot to see what else was in the nest. The entire time that I am wrestling bamboo and ratsnake, the adult cardinals are about two feet away hopping from side to side and raising a ruckus. This chick was still in the nest, the last course in an almost three course meal. It was too late for course number one, but course (almost) number two was back in the nest now along with clueless course number three who snoozed through the whole event. Does this cardinal chick make me look fat? With the chick out of the snake's mouth and the snake in hand, I headed across the property to a place of thick brush, where a grey ratsnake could get cozy and digest his meal ... and maybe forget the way back to the bamboo patch. Of course I had to take a selfie ... snake in the hand and all that. Chill Grey, I know you're not the bad guy. You're just an awesome combination of hunger, muscle, and incredible climbing ability. One chick instead of all three. 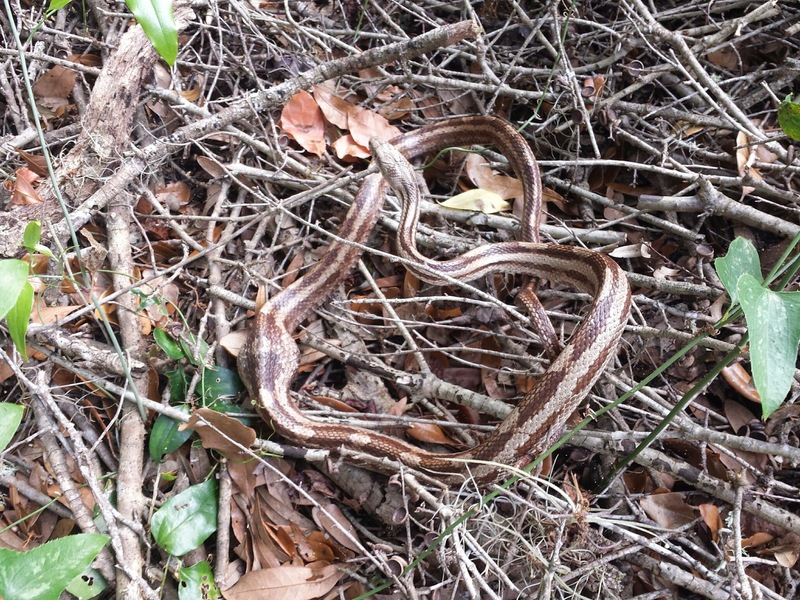 Grey, just before slithering beneath the brush pile. I'm really wanting to get more chickens now. Aaack! Harrowing! I too have done the one-handed snake wrassle. I remember trying to get a black rat snake out of a Carolina wren nest it was busy cleaning out. I'd no sooner toss it to the side and put a chick back in the mangled nest than that snake would be right back up the drainspot! 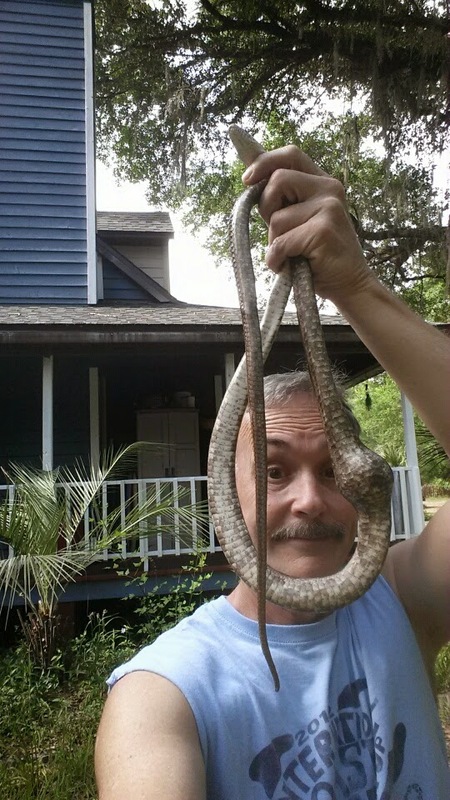 Don't get between a rat snake and its dinner! Extremely well-photographed, and a nice save. Here's hoping his homing abilities are poor. Definitely a win! But I don't really get how you made the snake open up to let go of the check! Tell me in case I need to perform this operation someday! Also, I know the rats name is not venomous, but will it bite you while you're messing with it? Does it hurt? *rat SNAKE not rats name! Haha it's me again. So, I reread the post and saw that the snake just kind of spit out the chick, right? So you didn't have to force open its jaws, I guess. In any case, WELL DONE AS USUAL!! Wonderful save of that little cardinal chick, FC. Sure hope the snake forgets where it found such a yummy meal. Checked my baby bird paintings...the little one you saved is about Day 4, and the bigger one still in the nest is Day 5. They fledge as early as Day 9, able only to flutter and clamber about, but that sure beats huddling down in the nest, waiting to be eaten by a rat snake! Hang in there, little cardinals! And cardinal parents, go get Mr. Powers if that snake comes back! Dear mercy FC, this post is x-rated for revulsion. Sorry, I jes' cain't bit partial to no snake. But...photograph is swell, sir. Oops, that's R-rated for Revulsion. Oh, I hope he stays away. We have removed garter snakes from the garden pond, which is tiny and only supports a couple of frogs....they always seem to come back. Good job on the saving though. Great story and photos. Congrats on 10 years of PF! Nice save on chick #2 and I love the way you framed your face in the selfie. Lol. Always interesting reading your blog. Great selfie! So glad you saved the chick! Another great rescue adventure! Good show! My experience with banty hens (involves an ankle scar) tells me there may be a rat snake carcass in the future. If we knew each other better, I'd be tempted to refer to the most excellent selfie and inquire about which one was the snake, but since you're not familiar with my wonderful sense of humor, I'll refrain. My family and I are moving to Jacksonville and my daughter happens to love birds, and I thought your post was awesome! I’m glad “Grey” did not eat all three of the baby birds – would’ve been a little greedy of him lol. Your pictures are awesome too. I try to follow local blogs in our current hometown, so I was looking for new ones in the North Florida area and stumbled upon yours. Your blog looks like one that my son would like to read, so I will pass it on. Thanks for all of the great wildlife posts, the pictures really are cool.